I wanted to scream but instead let out the smallest squeal, quickly remembering that I was in a library. After a weird look from a student sitting near me, I calmed myself down and kept reading. I had been accepted into Brown University, where I am now. That acceptance letter made me feel happier than I had in awhile, maybe even that whole year. The funny thing is, that feeling of happiness was all too familiar. I had felt almost the same way when I got into Swarthmore. Actually, I was even more excited about my acceptance to Swarthmore because college decisions felt like a much bigger deal back then. So what changed, and why did I leave Swarthmore? Maybe my high expectations of Swarthmore had something to do with it. I loved the idea of going to Swarthmore and looked forward to it more and more during my gap year. 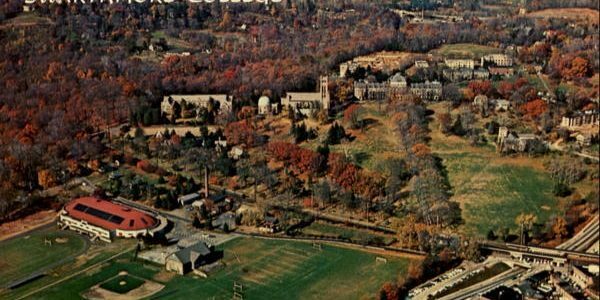 But a few weeks after arriving on campus, the initial excitement wore off, and I started to realize that Swarthmore really wasn’t the perfect place for me. While academically I was enjoying classes like Bio 1 and Narcissus and the History of Reflection (a first year seminar), I couldn’t help but think I wanted more classes to choose from. I wanted to study neuroscience as well as science and society, which involves studying how science interacts with society through different lenses. Last semester at Brown, I absolutely loved Introduction to Neuroscience not just because of the class t-shirt, but also because I learned about neuroanatomy, vision, pain, addiction, mental illness, and more. Just as importantly, I wasn’t happy at Swarthmore. I often felt trapped and frustrated, partly because of the small campus. Being from LA and having taken a gap year, I missed the energy and excitement of cities, and I found myself on a train to Philly every weekend. It was also clear to me that not many of my friends felt the same way—when my friends and I returned from Philly one evening, they told me how nice it was to be back on campus. I, on the other hand, wanted nothing more than to get back on the train. By the time I went back home for winter break, it was clear that I needed a different environment. So for the next few months, I worked on my common app and wrote essays about why I wanted to transfer. The hardest part of the process was asking my professors for recommendation letters because I knew they loved Swarthmore. Thankfully, all of my professors were fully supportive and understood my decision. It was particularly reassuring when one professor told me that some students feel the same way when they come back from studying abroad. After receiving decisions in May, it took me a while to decide to come to Brown. What if Brown wasn’t right for me either? Ultimately, I decided to take that chance and am happy to be where I am now. I love being in a bigger school with a lively atmosphere (even though it’s much colder here). I love that my roommate is a dual degree student studying anthropology at Brown and furniture design at RISD (she even made a table for our room), and that I can shop classes like Death, Health Care in the US, and Cognitive Neuroscience of Meditation. And of course, Brown gets bonus points for having a Starbucks two minutes away from my room instead of 20 minutes. But at the same time, there were definitely some things I took for granted at Swarthmore, like my relationship with my professors. Ironically enough, leaving Swarthmore has made me appreciate it even more. Yes, it’s definitely not the best school for me personally, but I feel incredibly lucky to have gone there for a year. In fact, I talk so highly of Swarthmore that it’s a top choice school for both my sister (a senior in high school) and brother (a freshman trying to transfer). When I tell my friends at Brown about Swarthmore, even they agree that they would love to have the kind of professor interactions that Swarthmore students have—they’re amazed that my intro biology and chemistry professors not only knew my name but also helped me write my papers and showed up to problem sessions three times a week. Now that I’m at Brown, I understand how incredible and valuable those interactions were, especially for a freshman. Sometimes, I really do miss being a student there. I miss the walk from the Science Center to Sharples in the evening, having discussions over tea and snacks at the WRC, and most of all, seeing my friends at Swarthmore every day. The way I feel about Swarthmore is similar to how I feel about Korea—even though I spent most of my life in LA, I still consider Korea another home, with family and people I care about. That’s why, even as a student at Brown, I still love Swarthmore and consider myself a Swattie. When you were at Swarthmore, did you look into taking classes at UPenn? My understanding is that you can take classes there for things that Swarthmore itself does not offer. Currently I am applying to Swarthmore as an undergraduate student and was also hoping to study neuroscience. However, the idea I got from your article is that there isn’t a neuroscience major/it is very lacking and limited. Is this what you meant. I have asked the admissions office both through email and during a visit about the neuroscience major and received mixed information. I hope you can clarify this since Swarthmore is one of my top choices and I really love it’s smallowed school environment. Hi Michelle! Thanks for leaving a comment. While Swarthmore does have a special major in neuroscience, I chose Brown for more courses in neuroscience as well as in other fields like Science and Society. I’d love to tell you more about my experience and answer any other questions you might have—feel free to email me at eojin_choi@brown.edu.